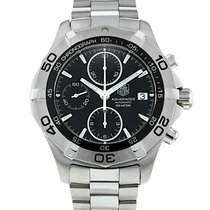 A pre-owned in excellent condition automatic movement 41mm case size stainless steel Tag Heuer Aquaracer Chronograph model reference CAF2110.BA0809 with a black baton dial featuring a date aperture at 3 o'clock surrounded by a brushed finish 60 minute uni-directional bezel on a full retail length stainless steel Tag Heuer Aquaracer bracelet. This watch is supplied without the box and papers. 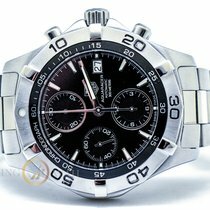 As with all of our pre-owned watches this watch comes with a full 12 month warranty with ourselves that will be invoked from the day of purchase. We welcome all trade-in's please let us know exactly what you have. 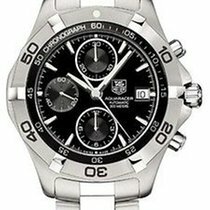 We will also buy your Rolex or any other prestige watch. 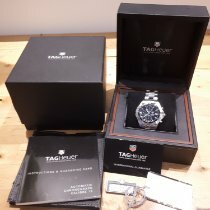 Please note all images are of the actual watch we are offering for sale. We do not use stock images under any circumstances. If you have any questions please do not hesitate to contact us and we will respond back in a timely manner. All of our watches are available to view in our store strictly by prior appointment only. Payment can be made in our store, we accept most major cards, bank transfer or cash. We are available at most times by email, telephone, mobile phone, SMS and Whats App. Shipping: All of our watches are ready for dispatch the same day subject to cleared payment. All packages are secure, insured and are dispatched via next day delivery to mainland UK. For delivery to the EU we endeavour to provide the same service. Please contact us for confirmed delivery quotes regardless of your location. You will be liable for any taxes/duties/import charges that your country may impose.